No, not a flaw in the middle. I have a number of older fabrics that were manufactured by running on some sort of machine. I guess the machine clamps down to hold it steady to be printed. I have managed a number of times to cut my fabric close to the edge. (trying not to waste it). I did not realize it until I have sewn several pieces together that they are there. Once I had a top half done before I noticed it. Do they still do this? I buy mostly batiks now, so I don't know. Haven't thought about it. I've seen it, bought fabric like that, but honestly don't know how long ago I bought it. I've seen what you're talking about but it's been a long time. I have seen it in the selvage sometimes but I always cut my selvages off. If the holes are tiny enough would they not close up after washing/drying?? If it were for a wall hanging that was not going to be laundered I might think differently. But for a quilt that will be washed/dried either before gifting or in general use, would they disappear?? As in, if we rip (oh no!) a seam or 6, those holes close up upon laundering?? Just a thought. I have only seen it on knits and fleece lately. Very aggravating when you need the full width. It sounds to me that you might be using feedsacks from the 1940's. I have never even seen a feedsack. These are fabrics from quilt stores. I started quilting in 1992, so it's a while back but not exceedingly so. A selvedge end with tiny holes is from the hooks used on fabric looms by textile companies during the manufacturing process. They should be cut off just like the opposite selvedge with the fabric info printed on it. I agree. 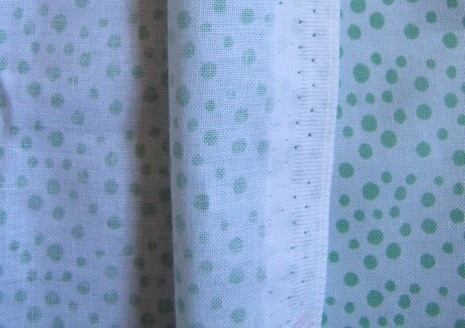 I have these holes in some fabrics, even without such an obvious selvedge. They do not close up, so they are part of what you would either cut off or include within the seam allowance. I consider those as part of the selvedge and cut it off. Otherwise it seems to be wrinkly and distorts the shape of what I'm trying to do. Some day this discussion will be provided as the source of the saying; "cut off your selvages before using the fabric". This picture shows the holes actually in the selvedge and needs to be cut off. But sometimes the holes are in fabric that could be used. I have used my thumb nail and rubbed over the holes in many directions. That is a big help. And after that, they really are hardly noticeable after washing. I don't cut much off of selvedges. If the print goes to the edge, I only cut off that last edge that is heavier than the rest. If there is white showing, I cut off enough to let about 1/8 inch of white showing. That goes into the seam allowance. You can see, I don't waste. I have wet the fabric to see if the holes disappear. Sometimes they do and I use it and sometimes I just cut it away. I cut the holes off, and I cut off the heavy selvage. I might use the white labeled part in the seam allowance of what I am making only if I am running short of the fabric. They are part of the selvedge, found on most all fabrics except maybe batiks. Just cut the whole selvedge, including the tiny holes, off. I was taught to always remove selvages and this is what I do. I remove them as I do my cutting, it is just a habit developed out of years of sewing. The selvages are still there even if the holes aren't. This fabric is coarser and I find it to be scrap usable for other projects. Last edited by Aurora; 04-29-2018 at 07:08 AM. I've found that batiks often have those holes. I was told it was the way the gray goods were fastened on to the frame during the batiking process. I've been told that they shrink...gather...after washing, so I always cut them off. I try not to waste also as I often work scrappy. I look at the weave. Often one selvedge has a wider heavier weave. I think that it would behave differently during washing and drying so I cut that off. The other side often just has a 1/4 inch of stronger weaving so I cut each side independently. I use some selvages in the garden to tie plants to stakes. They work very well for this purpose. The ones with fabric information I save for selvage projects.